This type of magazine allows diameters ranging from 8mm to maximum lathe spindle diameter to be processed. 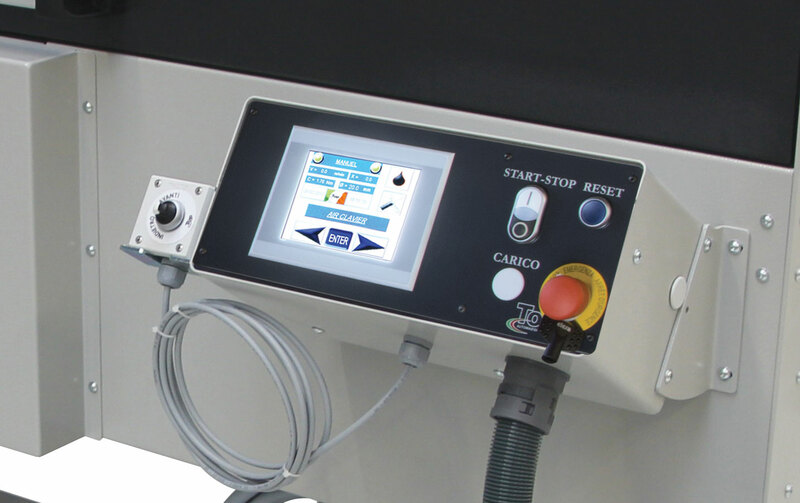 The process bar diameter is automatically adjusted by setting the loader PLC that also selects the column to be used. 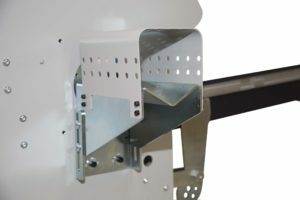 Proximity sensors check for on the magazine and a fence protects the loading area so that the operator cannot access areas with moving parts. The customer can request a magazine cover with plastic polythene material in order not to ruin the processed material. The MAGIC ELETTRIC loader is managed by a PLC, which interacts with a Brushless motor and solenoid valves, to regulate the feed speed, the thrust force and all the automations. 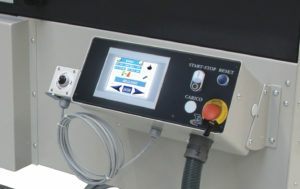 In fact, it is possible to reprogram the diameter to be processed in just 60 seconds from the PLC. 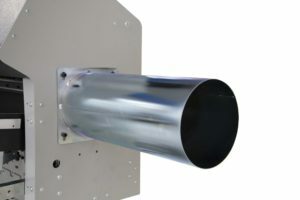 COVER SHEET METAL TUBE, is a 200mm diameter 500mm long sheet metal tube that can be secured on the front loader head. Its function is to cover any distance between loader and lathe so that the operator does not have access to areas with moving parts (it has no structural characteristics). 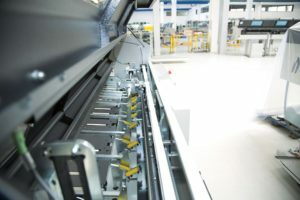 ADJUSTABLE ROLLER CONVEYOR, is an extension of the loader secured to the front head which can be manually adjusted in height to support the bar diameter that is being processed, It is available in three lengths 200-400-600mm and has an upper casing that prevents the operator from accessing areas which have moving parts. Necessary for those lathes that have a spindle inside the bodywork to support the loader output bar up to the spindle input. MAGIC SELF-CENTRING BUSHING SYSTEM, is a system that the customer can purchase separately and allows those lathes that have a spindle of less than 1200mm to process bars up to a length of 1600mm supporting the rotation of the bar portion that will protrude from the back of the spindle. MAGIC SELF-CENTRING BUSHING is a system that supports the guide bar reduction through the self-centring hold of 6 bearings that allow it to rotate and stabilise the bar being processed, the reduction must have an internal diameter of 3 to 5 mm larger than the bar being processed. Axial drive system For the insertion of the reductions in the lathe spindle, the loader is equipped with a drive system that makes axial movement of about 800mm possible. The loader is secured on its tracks by means of a quick coupling. Radial drive system For the insertion of the reductions in the lathe spindle, the loader is equipped with a drive system that makes radial movement of about 800mm possible. The loader is secured on its tracks by means of a quick coupling. The loader guide channel is mobile, so you can process bar diameters from 8mm to 100mm, all adjustable via PLC keyboard. The channel components are made of plastic material, in order to make bar sliding more silent and linear. 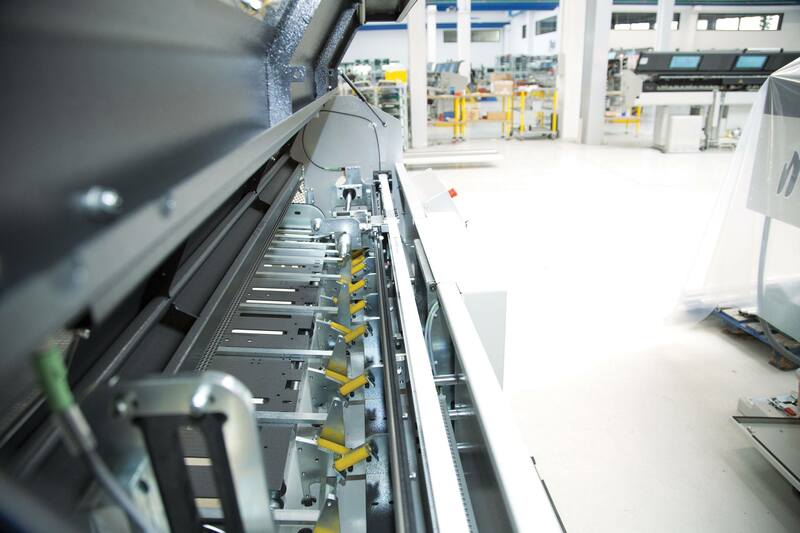 MAGIC ELETTRIC includes an electrical system entirely designed and assembled in Top Automazioni with high quality brands such as: Phoenix, Eaton, Esa, Siboni. 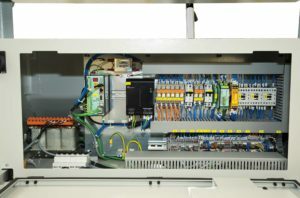 TOP AUTOMAZIONI includes any interface required by the lathe on its loaders wired to the specifications of the lathe manufacturers such as: 24-pole interface, profibus interface, ethercat interface, modular multipolar interface. 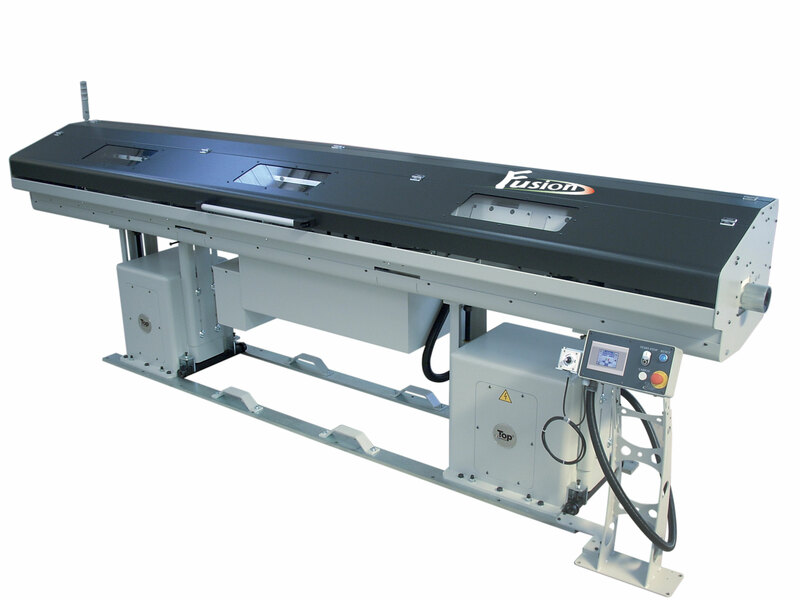 MAGIC ELETTRIC is a loader suitable for processing bars with a maximum length of 1600mm and for shafts already cut to size with a minimum of 200mm. 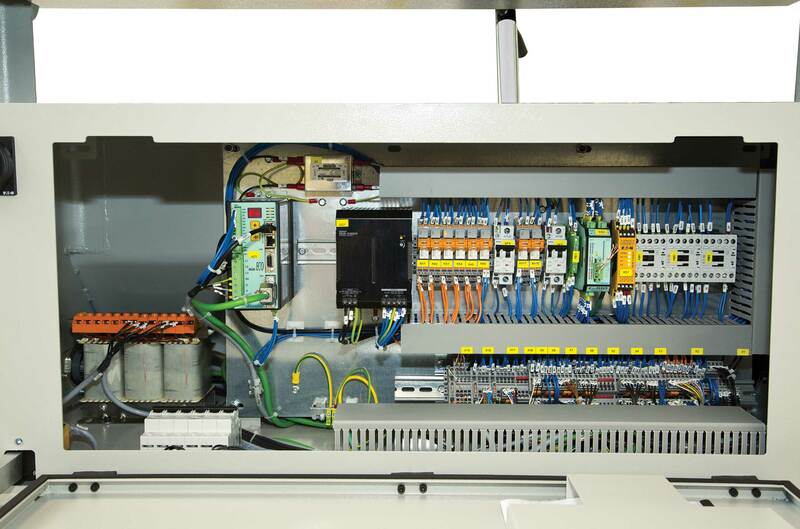 MAGIC ELETTRIC has a working range that goes from a minimum diameter of Ø8mm to a maximum of Ø100mm and fully self-adjusts from the PLC panel. 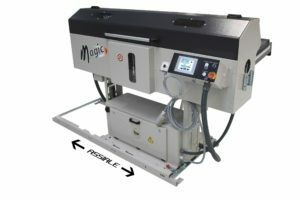 MAGIC ELETTRIC does not need to be connected to the pneumatic mains as its automation is via electric motors. 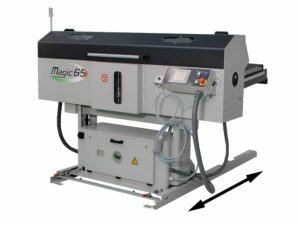 To centre the bar with the lathe spindle, MAGIC ELETTRIC for has a guide channel composed of polyurethane rollers that automatically positions itself and introduces the bar to be processed with the thrust appropriate to the process diameter. In order to work correctly, this type of loader requires the insertion of reductions inside the lathe spindle and MAGIC ELETTRIC is equipped with a dual axial and radial drive equal to 800mm to facilitate this operation. It is a fast and accurate loader and can also be installed together with a magic bushing that allows those lathes with short spindles to process even 1600mm bars in complete safety. MAGIC ELETTRIC has an adjustable inclined magazine with storage capacity equal to 800mm and, for those who process bars already cut to size, it can be equipped with a multi-column version where the bars can be stored on the magazine in several rows increasing the work capacity. Need other informations about MAGIC ELETTRIC?